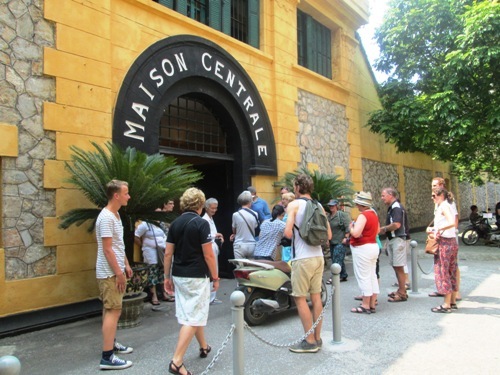 Hoa Lo Prison is a historical notorious place that I will suggest if you ask me where to go in Hanoi. In 1896 French colonists - I prefer to call them invaders - built that prison to detain Vietnamese prisoners, especially political opponents. They aimed to suppress revolution movement in my country as well as in the whole Indochina. The jail’s original name is Maison Centrale. It means Central House, a traditional euphemism to denote prisons in France, according to Wikipedia.com. Vietnamese called it “Hoa Lo”, meaning “fiery stove”. The name originated from the village’s name “Làng Hỏa Lò”, which was demolished by French to build such largest prison in Indochina. The village had traditional profession to produce and sell wood stoves and coal-fire stoves from pre-colonial times. Visiting the place now, you can still feel terrible conditions and severe cruelty. All the harsh conditions were used to melt down spirit of prisoners: It is easy to die but hard to live. Prisoners were severely isolated, starved, beaten, and tortured. Prisoners detained in prison cells were cuffed and shackled both arms and legs by chain and leg-irons. There was solitary confinement (cachot, or dungeon) for dangerous prisoners. Still in a tiny cell, a life-size model of an inmate is shackled onto concrete floor as an illustration. 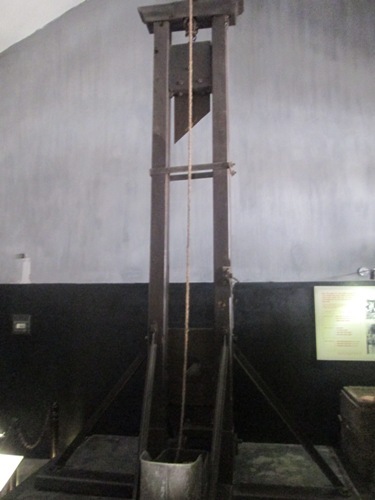 Guillotine (head cutting machine) was used to behead death-row inmates. Just besides the killing-machine, there’s a terrified photo of its product: three guillotined heads put in bamboo baskets. Horrible! 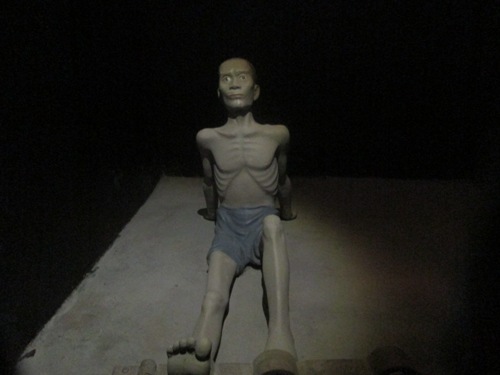 Seeing the horror of life in Hoa Lo prison really makes me stunned. Just imagine how people can manage to survive in such terrible conditions, I dare not think further. 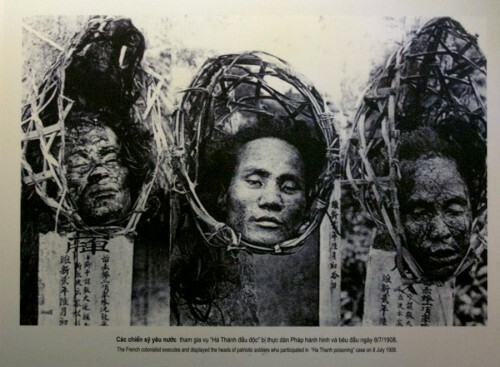 Watching such exhibits, I feel sorry for my Vietnamese fellows, and hatred at what French colonists did to my people. 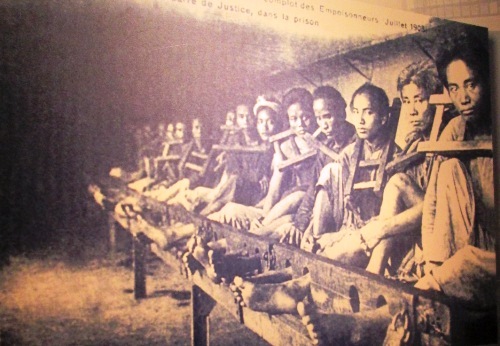 They came here to exploit our nation to enrich theirs, and Hoa Lo Prison is a symbol of such colonist exploitation and an evidence of their crime. From 1964-1972 Hoa Lo Prison held prisoners of war (POWs), especially downed American pilots. They included US Presidential candidate, John McCain, and Douglas 'Pete' Wilson, America's first Ambassador to the Socialist Republic of Vietnam. And “Hanoi Hilton” is the name that US prisoners sarcastically used to call the jail at that time. You should tell apart that nick name with Hilton Hanoi Opera Hotel located next to Hanoi Opera House. There are a couple of rooms about this era. 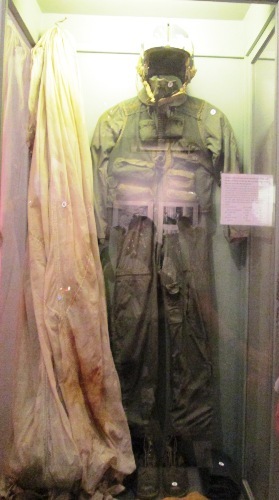 You can see many photos and exhibits about US prisoners including a pilot flight suit, supposedly of John McCain. I read some articles and forums that complain about the bad treatment of the captors to US prisoners in "Hanoi Hilton". I don’t agree with such complain. The US pilots flied here to bomb my country, even intentionally "back to stone age". Being shot down and captured, are they too ambitious when expect to be welcomed as honors guests? I believe not. Even the world-class Hilton Hotel now is not willing to host uninvited guests with such dreadful intention. Now, what we see is actually a relic of the former prison. 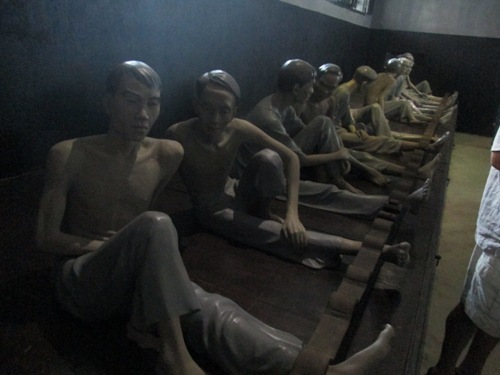 Hanoi authority keeps part of the prison and turns it into a museum. The other part was turned into a commercial complex with a skyscraper named Hanoi Tower. Getting to the museum is quite easy. It is on the corner of Ly Thuong Kiet and Hoa Lo Street, about 2 kilometers (1.2 miles) from Hanoi center. You can spend about an hour to visit. Most exhibits have English explanation. Yet, it is more helpful and funnier to hire a guide. Last time, I joined a tour group with guide. I can understand a lot more information from the handsome guide. I like his saying: no matter where you (the foreign visitors) come from, even France or the US, you're all welcome here in Vietnam. Our nation did suffer a lot from what the invaders caused to us. But wars have gone for decades, and Vietnamese people have forgiven, or even forgotten when war injuries have been healing. If you have visited the Hoa Lo Prison, you might want to share some of your thoughts here. How do you think about the relic?